For dish antennas used to transmit a signal over large distances, the on-axis gain scales as $D^2/ \lambda^2$ or $D^2 f^2 / c^2$ where $\lambda$ and $f$ are the wavelength or frequency and $c$ is the speed of light. All else equal, doubling the frequency means four times the power received by a distant receiver with a fixed receive antenna area. Question: Excluding optical frequencies, what is the highest frequency that has been used or even tested with spacecraft that could be used beyond Earth orbit? I'm looking for an approximate frequency, not just a letter-code for a band designation. note 1: reception in Earth orbit (as well as on Earth's surface) counts for this question. note 2: I've adjusted this question a bit to allow for testing that wasn't necessarily done beyond Earth orbit, as long as the results are applicable and informative toward potential use beyond Earth orbit. 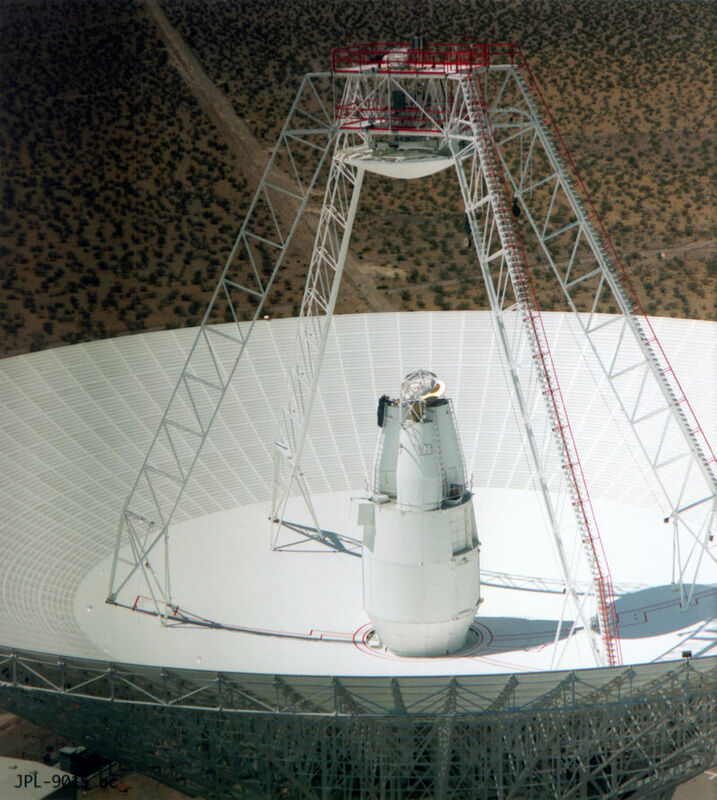 below: 70 meter dish at the DSN's Goldstone complex. For scale, note that red paint denotes walkways and stairs. From Gizmodo. At the top end of the lower window, there an experimental effort using the AlphaSat Aldo Paraboni payload to measure space-Earth effects in Ka/Q and lower V bands. The Ka/Q effort is looking at attenuation and propagation around 40GHz. The V effort is looking at 48GHz. There are several paywalled IEEE papers on results, but unfortunately the only non-paywalled sources I can find are just about the equipment tests. That V band campaign might count as "highest frequency tested", though this isn't really "deep-space communications" yet. edit: Since I'm also the OP, after accepting @BobJacobsen's answer I've slightly revised the question to allow for another, very informative answer, which addresses testing of a higher frequency band through the Earth's atmosphere, though the testing was done from LEO and not deep space. This answer here is about the highest frequency used or tested from deep space. I'll post this as a tentative answer. I'm not 100% sure a higher frequency hasn't been tested but it looks like the Deep Space Ka-band frequencies around 32 GHz is the highest that's received substantial, systematic testing and use in deep-space. I should also point out that the Transiting Exoplanet Survey Satellite (TESS) will be using Ka-band from cis-lunar space (roughly speaking) as discussed in the question Will there be “Near Space” Ka band allocations for TESS? I should not that all of these seem to be downlink. I haven't found any corresponding Ka-band uplink information. The Kepler Telescope has been using Ka-band to downlink processed data regularly over the distance of roughy 1 AU. Among the highlights of these was setting a single day record for data return from a deep space spacecraft (133 Gbits) achieved during one 10-hour pass; achieving the highest data rate ever from a planetary mission (6 Mbps) and successfully demonstrating Ka-band DDOR. I'm not sure of the distances, the experiments seem to have been done during the cruise-phase of the mission before orbital insertion. Lower frequency telemetry bands are becoming more limited in bandwidth with more competition between flight projects and other entities. Higher frequency bands offer significantly more bandwidth and hence the prospect of much higher data rates. Future or prospective flight projects considering Ka-band (32-GHz) telemetry data links are interested in past flight experience with received Ka-band data. Over 10 years of Cassini closed-loop received Ka-band carrier data involving over 2 million individual measurements were acquired at all three Deep Space Network (DSN) sites. We analyzed these data to characterize link performance over a wide range of weather conditions and as a function of elevation angle. Based on this analysis, we have derived a recommendation for telecommunications link margin for preflight planning purposes. These results suggest that a 4-dB margin will ensure a ~94 percent data return at a minimum 20-deg elevation angle under 90 percent weather conditions at 32 GHz (Ka-band). Not the answer you're looking for? Browse other questions tagged deep-space radio-communication deep-space-network or ask your own question. 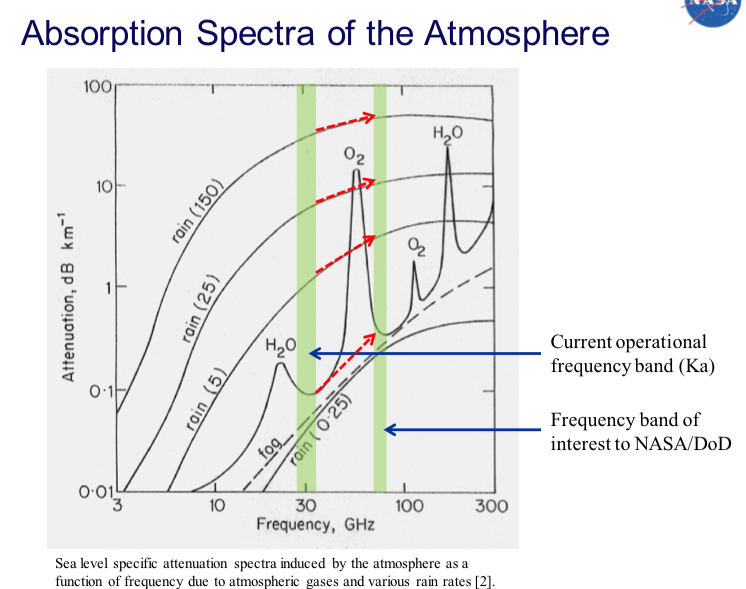 Which is stronger per Hz, radio signals from a Mars spacecraft, or Mars' blackbody radiation?